We look at how you can display your Which? Trusted trader reviews summary on your own website. Which? 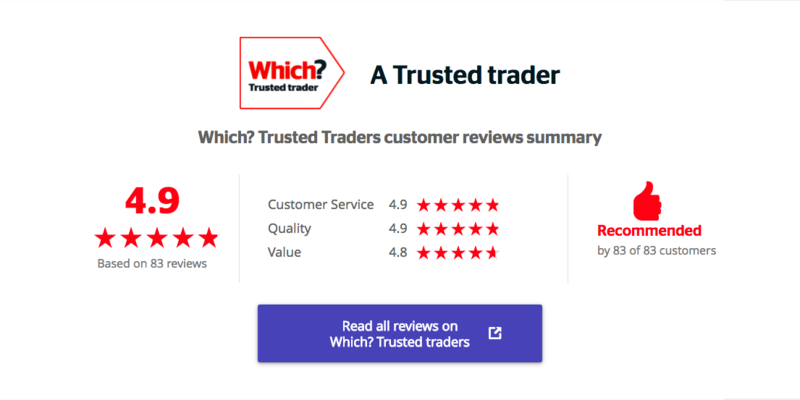 Trusted Traders provides you with a profile page that allows you to build up a library of reviews from your customers. The combined ratings provided by your customers give your business on overall star rating for customer service, quality and value. These reviews, and their accompanying star rating, can provide potential customers with reassurance that your business operates openly and fairly. Until recently customers would have to go on to the Which? Trusted Traders site to find this feedback. But now, Which? Trusted Traders is giving you the opportunity to share this information on your own website, too, with a handy widget. You can put this overview of customer feedback, your combined star rating and the number of reviews on to your site – an example is shown below. There’s also a direct link to your Which? Trusted Traders profile page, to make it easier for your customers to find and read the reviews for themselves. Letting your customers access this information directly from your own site has to be good news. The information is dynamic – so the rating and review numbers will update as more reviews are added to your profile page, ensuring it’s up to date at all times. The display also changes according to whether your customers are looking at it on a desktop computer (the version shown above), a tablet or on a mobile (both shown below) – ensuring it fits whatever screen they are using. If you’d like to get more reviews on your profile, check out our tips on how to ask your customers for reviews and advice from some of the Which? Trusted traders that have amassed large numbers of reviews already. Sounds great. What do I have to do? Your customer relationship executive at Which? Trusted Traders can give you the code for the online widget, which you will then need to implement. This code will allow you to place the tool on your site. If you have some knowledge of HTML, you may be able to add it yourself. If you’re not sure how to do it, your web developer should be able to make the coding adjustment for you. This should not be a complicated or expensive process; it should be a small change to insert the code for this tool into the right section of your site. You could go back to whoever designed your site for you, or find a local recommendation for a web developer. There’s more information about how to find a web developer in this article about how to get the right website for your business. For more information call your customer relationship executive on 0117 456 6032.